These colored photographs show various scenes of the move from the 'East Campus' to the 'West Campus.' In 1925, the Menninger Sanitarium Corporation purchased a farmhouse on the west edge of Topeka, Kansas. The farmhouse became the inpatient clinic and the surrounding 20 acres were developed with buildings and gardens to become the "East Campus" of the Menninger Foundation. In 1982, the "West Campus", a much larger area, was developed west of Topeka, a residential scale community of 28 structures on a 350 acre hilltop campus. In 2003, the Menninger Foundation moved to Houston, Texas. 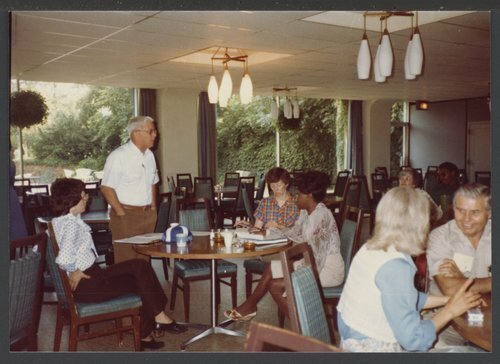 Moving day to Menninger Clinic West Campus, Topeka, Kansas - The planning committee meet weekly, then daily, before the June, 1982 hospital move. Here are D. Page, R. Mailen, K. Pirrie, P. Washington, P. Levy and D. Olson.